Here's the deal: I'm just not that into color. While i love and appreciate it on others, I simply don't particularly enjoy it on myself. Muted neutrals are my jam. Sometimes you'll find me dipping into certain hues I have soft spot for, like red, green or pastels, but mostly I prefer to stick to black. Or in this case, to white. On certain occasions, I'll reach for a print, but when things are too loud, I get the jitters. That most certainly does not equate to boring -- in fact, donning one single shade from head to (almost) toe packs just as much of a punch as print-mixing. It takes as much confidence to rock a monochromatic ensemble as it does the latter. I highly recommend you give it a go: it's one of the few fail-proof ways to ensure an easy breezy look on a summer day. Like something? Click to shop! I'm loving this whole look on you girl!! I'm exactly the opposite :) I love muted neutrals on other but can't seem to stay away from colours and prints ha! Will take this as an inspiration to brave the mute look as I love this one. Love no color outfits, these are the best! Love this all white outfit, it's perfect on you! love the fresh and clean feel of a mostly white outfit! love your sandals!! Love the look…those white jeans look awesome on you! And your images are making me miss NYC. I moved to LA last year (and love it) but still miss NYC soooo much! I love that sleeveless tux vest....hoping to find one as lovely soon! that supersize vest is key to this amazing look. great job! Spoken like a true New Yorker! Haha. I hear you, I use to be...wait for it...a goth...so I can relate. But since have brought some color in to my life, but it aint easy. White, black, and gray are still my go to's. And what a great look I have white jeans, a gray tee, and black sandals now all I need is a white vest! I never feel like I can pull of white pants, but you make it look so effortless and chic! Love it. I love how this colorless ensemble makes a striking impact by way of the chic and modern proportions you have used. Thanks for your visit, Happy Weekend! i'm really loving all white/super muted ensembles lately-- theyre just so effortlessly chic!! I'm the same way. 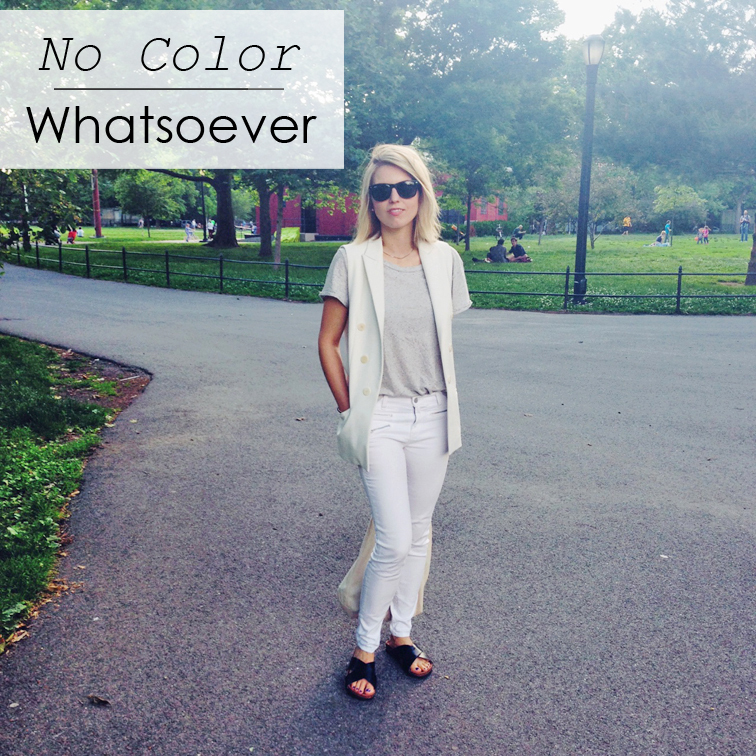 Despite being colorful on my blog, I love neutrals. Great outfit. Omg PREACH. It's most definitely not boring, THANK YOU. Love this outfit so much - the sliver of a necklace, the cool tuxedo vest, your effortless hair! !